THINKING THURSDAY: SOMETHING TO PONDER IN THE WORLD OF FOOD AND FARMING. Have you heard? The New York Times is calling all carnivores to tell them why we believe it is ethical to eat meat. Since this is a topic front and center in my mind nearly every day and I planned to discuss it with you anyway, how about right now? The stingy 600 word limit was a real hardship for a chatty girl like myself; hopefully Word’s word count tool is accurate! I sent my blood, sweat and tears off into the electronic sunset, and from there, who knows? Weigh in with your opinions in the comments below, but do play nice. I’m anxious to hear your thoughts on the matter. This question of whether it is ethical to eat meat cannot be deeply understood by anyone with clean hands. My point? A formal decree from above is not coming. Fancy panel of judges or no, there isn’t a single right answer to this dilemma. Like death itself, we each have to wrestle this contradiction alone. The real ethical question? Will we humble ourselves by taking a ruthlessly honest look at the toll our lives extract from others? My guess is we’d rather shield ourselves from introspection with dueling data, finger-pointing and clever bumper-sticker retorts. Nature has an uncomplicated relationship with death. Nobody, two-legged or four is spared. We try hard to find a loophole, and Nature humors us. But she never lets us hide from her truth for long. To Nature, death is just part of life. Creatures are born, creatures die. The dead feed the living and the living eventually become the dead. Nature builds in harsh but perfect circles, not the logjams and cul-de-sacs we construct to avoid uncomfortable truths. Remember the scene in the movie Cold Mountain where the old lady kills the goat? The loving kindness the Goat-lady gave that trusting goat as she pierced its heart is a stunning moment. Is it cruel betrayal or the heartfelt kindness of a true shepherd? That goat didn’t suffer one bit, but sweetly laid down its head in eternal sleep, feeling safe in the trusted shelter of the Goat-lady’s lap. Somehow, the intentionality of the Goat-Lady’s act really jams our brains. The abrupt killing contradicts the peaceful mercy of that death. The dichotomy rocks our certainty. We’d rather cover our eyes. I raise cattle with love and tenderness, and I admit I cry every time I deliver one to slaughter. I don’t like slick words like “harvested” or “processed”. I prefer the unvarnished facts. A cow was killed because I decided it would be so. I won’t shirk my sadness or culpability with a perky elevator speech selling the rightness of my decision. My beautiful, one-and-a-half-inch thick piece of well-raised beef is carefully cooked: rare with a perfectly browned crust. I eat my steak mindfully with gratitude and pleasure. That steak is meaningful to me. I appreciate its full, bittersweet cost and I don’t waste a single scrap. It’s delicious. Recently, I plowed a field so I could plant some Monsanto-free organic vegetables. A commendable act most Vegans would agree. In doing so, I disturbed nests of bunnies and a home some peace-loving groundhogs have enjoyed for some time. It was traumatic for those little creatures, and the hawks that trawl my pastures were elated. Thanks to my vegetables, there was a new all you can eat buffet in town. I didn’t kill anything myself, but I knew creatures would be living there. They live everywhere. Ethical? We need to step away from our computers, books and chattering brains and deepen our understanding of Nature’s ways. Only by maintaining a distant, academic understanding of Nature can you believe in the moral superiority of tofu. When someone comes up with a real, actionable plan to free the animals, not rely on industrial foods and feed the soil in a sustainable way, my mind is open. Today, the most ethical thing I can do is provide a joyful, carefree life for my meat. In this way, and only this way, I say yes. It is ethical to eat meat. Life is grand, messy, confusing business. I accept my assignment of hands-on, eyes-open, deliberate participation. That’s as ethical as it gets. < Previous Is There Anything Nicer Than a Sleepy Sunday Morning? Next > what kind of future are you planting? I’m glad the NYT chose to run that contest. I think it’s helping to make people think more about where our food actually comes from. And I agree with you. I just happen to believe that all animals raised for food should have a decent quality of life. What we do now to many animals just so we can eat cheap meat is not ethical. But because we don’t see it, or think about it, we blindly allow it to continue. The whole system is built on a foundation of blindness. Well done. Thank you for taking the time to write and submit your essay. Nice work! That’s a perfect opening line. I struggle with this topic and know in my heart that I could not write an argument in favor of meat—I have too many doubts. I have my own curious relationship with meat, but would not make an argument to others either in favor or against. I have settled on keeping it close to home and infrequent, and that works for me. Go for it! This is excellent. Good luck, my friend. harmless their choices are before judging others. The hate and judging is what really gets me. common auction barn and big packing houses than I am about the death itself at a small facility. If I could have it done on farm, that would be the kindest of all. I have been a vegetarian for over 20 years (funny–I’m also a tofu-eating academic…), and I loved your essay. Gratitude, care, love, respect. These are the reasons that I do not eat meat, and they are the very same reasons that you do. Brava!! I would help you on your loving farm any day if we were neighbors!! Thanks so much, I’m glad you liked it. It’s so great that you are so open to the different choices others make in response to life’s gray questions. Congratulations and thanks for a really great blog!! Thanks so much. It’s nice to know somebody else cares about such things too. I’ll try not to let my head get too big and will do my homework asap. I really appreciate the nomination and your contribution to the conversation! I also am really glad that they are running this contest. You’ve done a beautifully eloquent job. I have never forgotten the goat lady and think of you in the same way. Thanks for writing this. And I don’t know if you read it but quite a while back, Eleanor wrote a beautiful piece called On Meat. Thanks I think : ) It’s taken me years to reconcile my feelings about the Goat-lady and I’m not sure I’m there yet. I hadn’t read Eleanor’s post – I’ll have to look it up. I’m sure it’s very thoughtful. Yes, it really was meant as a compliment. This was an amazing article. Thank you for writing it and I will be reblogging. We have raised our own meat over the years and you put into words exactly how I feel. Respect, caring, gratitude is what you need for your animals. I’d like it better if we could have our animals killed on our own property to spare them the travel at the end of their lives. The goat and the woman were perfect in my eyes. Thanks Jo. I hate that mine have to travel to a strange place too. It would be much kinder if they could be spared that. Thank you Auburn Meadow Farm. Did anyone study native religions? They thanked their cousin the deer and other animals for the food they provided. People who are literal about the Bible would believe that after the fall in the Garden of Eden, God set it so that animals provide food and clothing for humans. Sorry, but you cannot have it both ways. Believe all of it or none of it. Thanks Lucindalines, so very true. I don’t know how Bible quoters are so blind to their cherry picking, but they are. For myself, this only highlights why meat is an UN-ethical choice in my life. I have no access or ability to raise my own animals. I cannot afford to support local ranchers who treat their livestock with dignity, even if I wish to reward their efforts. 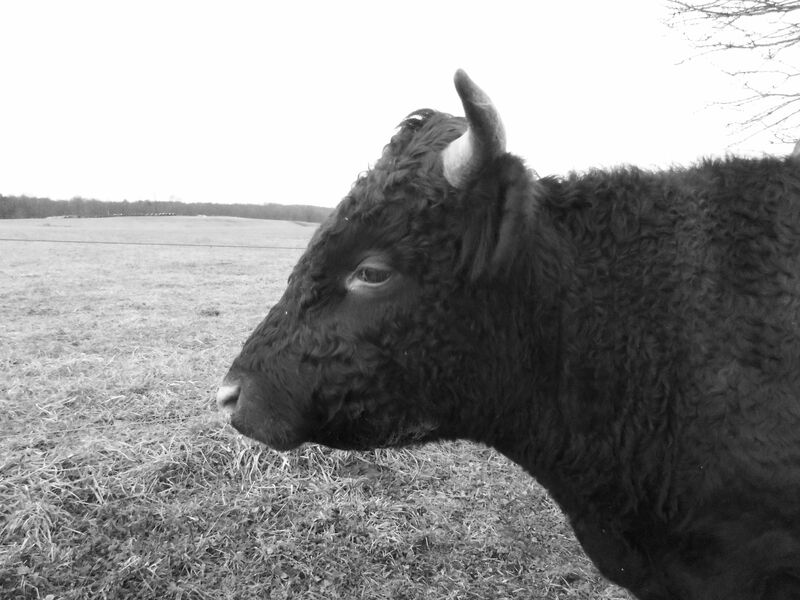 I am still in my 20’s, so there is hope that one day grass-fed, local beef (and chicken, eggs, etc.) may be a regular part of my diet, but until then, I will stick to beans and rice for most meals and fresh, organic, fruit and vegetables. I will occasionally eat meat which was hunted and fish that were wild-caught. I have also fished, scaled, gutted, cleaned, etc. with my own hands. Until someone can prove to me otherwise, I assume this must be far more humane than supporting the commercial meat industry. Thanks for the thoughtful comment and approach to life Charlotte, I appreciate hearing from you. Totally agree.